Virtual classroom training conducted online over five weeks; approximately 2-3 hours of work per week. Uses a combination of eLearning modules, instructor-led webinars, threaded discussion boards, online assignments and assessments. The target audience is professionals requesting authorization for organ donation. Join Gift of Life Institute for this unique learning opportunity. 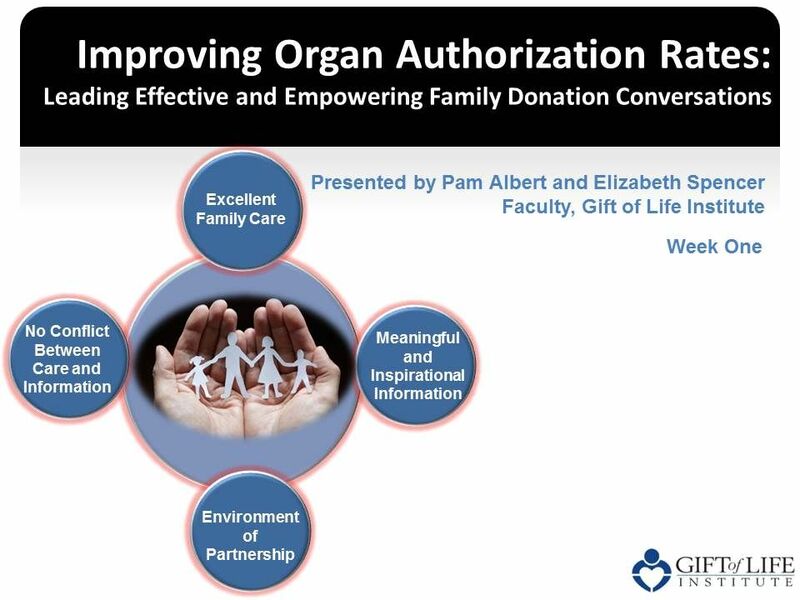 The course provides an introduction to the skills and knowledge required to provide timely, compassionate, and informed donation opportunities to all donor families in a variety of commonly encountered, straightforward, and challenging situations. Virtual classroom uses a combination of eLearning, instructor-led webinars (held weekly), threaded discussion boards, online assignments and assessments. Five weeks total (approximately three hours of work per week), plus one week for follow up assessment. The American Board for Transplant Certification has awarded 18.0 Category 1 CEUs for successful completion of this course. The remote learning is not necessarily natural to me, however, I thought the way it was set up and executed was very thoughtful and helped facilitate balancing the demands of working full time (plus!). The explanation of the donation conversation being a process rather than an event. That's an integral part of the donation process, and it helped to see it differently. Having a course specifically designed around communicating in the context of donation is helpful. I have actually been doing this for a long time, but I think one of the things that has traditionally made me the most uncomfortable is the concern about needing to keep a conversation flowing. I've learned in this class the value of pausing, sitting with silence and just being present. I feel like I've learned a lot more about getting beyond my own discomfort to be completely available for my families.